We spent our first day in Jogja just kind of wandering. We took a walk from the hotel into the main part of town, which involved yet another detour. (Jogja is hard to navigate and google maps does not apply.) After several hours of being hawked to, pounded by the sun and pressed by crowds, we were happy to duck into the state-run tourism office. It was quiet and air conditioned, and – best of all – it had information for a puppet show! 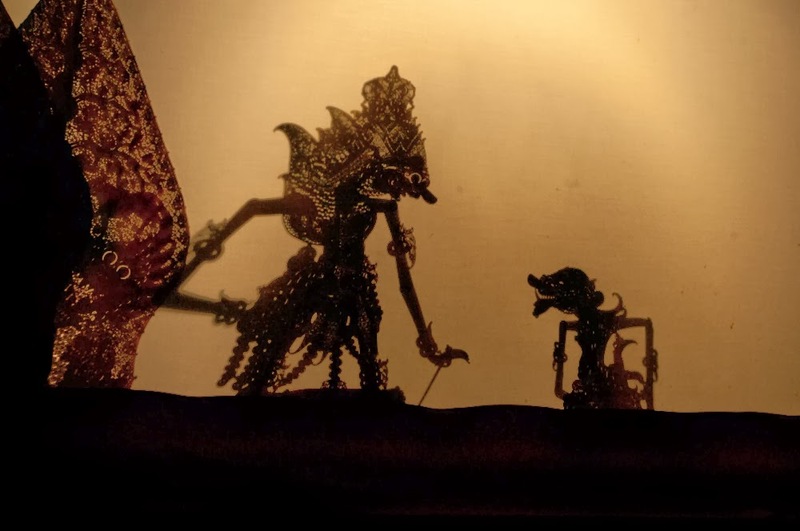 Ever since I got sick and we couldn’t go see a show in Bali, I’ve been on the hunt for a puppet show. I got directions to the venue and was ready to head back out into the crowd. Then Jason reminded me that we wanted to do a dawn tour of Borobudur. So, we bought tickets with a tour company for 4 am the next morning to go see Borobudur and Prambanan temples. Each character had about a dozen puppets of various sizes. Look close for the ridiculous detail in cutting and painting. The puppet show started at 8 pm. We got there early to see the puppet makers working their magic. The puppets are ridiculously detailed. Each image is cut out of buffalo leather. Then the details are punched, cut and carved into it. The hems of clothes are punched with lines of dots along the edge, the patterns in fabric are cut with tiny arch blades that make flower petals when applied correctly. The detail is exquisite. Once the cutting is done, they go on to be painted. 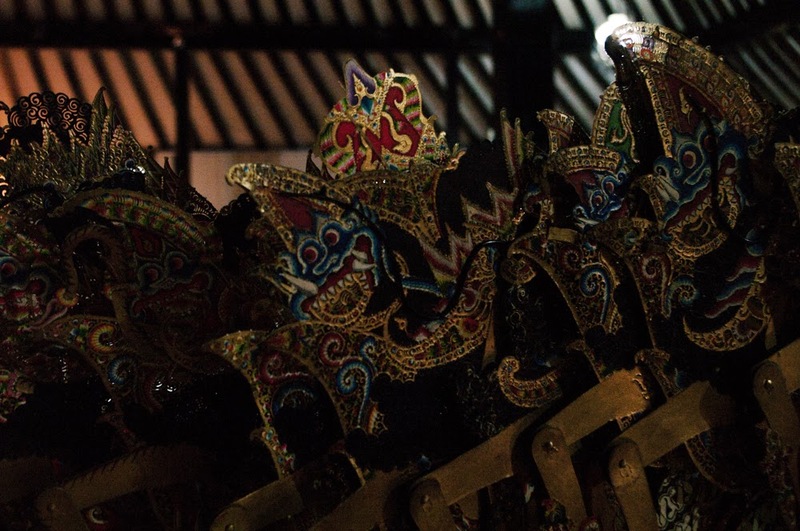 Even though these are shadow puppets, the painting is as detailed as the rest of it. Each character has a set “style,” certain colors and hair styles go with certain images. The last layer of paint is gold, which is used for edge and details. The performance itself was not what I was expecting. Coming from the tradtions of In the Heart of the Beast Puppet and Mask Theater, I’m used to lively puppets. When I think puppet show, I think of characters that dance and move and who’s gestures tell the story. The narration is a compliment to the story the characters are telling. This style of puppetry was almost the opposite. The Wayan, or master puppeteer. First, there is one puppeteer, who is also the narrator. Then, backing him up, are about a dozen musicians. Each scene starts with the appearance of the characters. Once they are “standing” on stage, they are fairly static. They had moveable arms, but with only one puppeteer, there was a minimum of movement. The scene progresses with conversation between the characters punctuated by singing and musical interludes. It was like a musical, minus the dancing part. The show that we saw was meant for curious people. They were set up to allow seats both in front and behind the stage. I walked back and forth between the puppet side and the back stage side to get a chance to see how it all worked. The performers were professionals, up to and including whispered comments during the show. Even with those comments, I couldn’t detect a single missed beat or cue throughout the night. 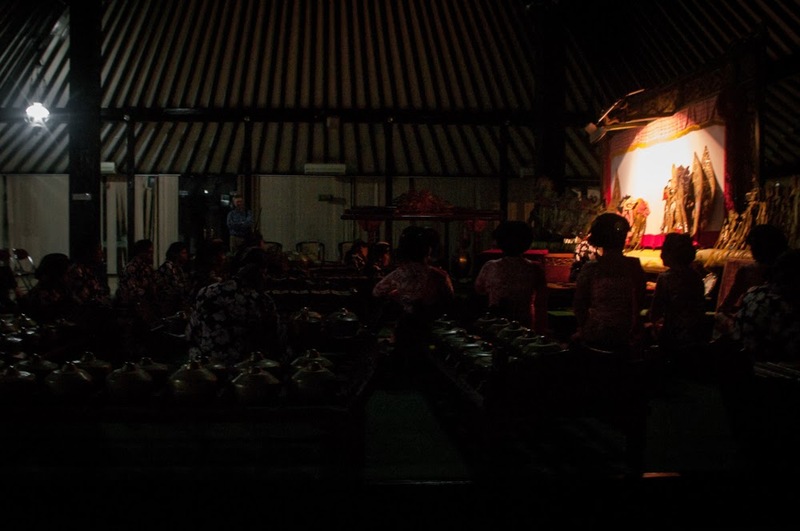 Then again, the whole thing was in the local Javanese language, so what do I know? You can see the articulated joints and the detailed cut outs in the hair and clothes. 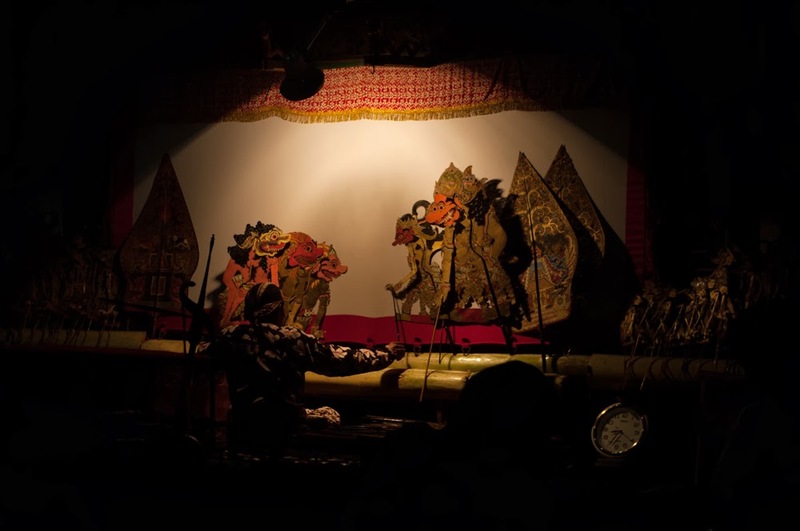 I really enjoyed seeing a Javanese puppet show. It is not a puppetry tradition I know or have experienced. I learned something, I saw art, what could be better?